Ebrahimifar, H., Zandrahimi, M. (2009). Oxidation behavior and electrical Characteristics of used interconnects in solid oxide fuel cells at presence of Mn3O4 and MnFe2O4 coatings. International Journal of Iron & Steel Society of Iran, 6(2), 24-27. H. Ebrahimifar; M. Zandrahimi. "Oxidation behavior and electrical Characteristics of used interconnects in solid oxide fuel cells at presence of Mn3O4 and MnFe2O4 coatings". 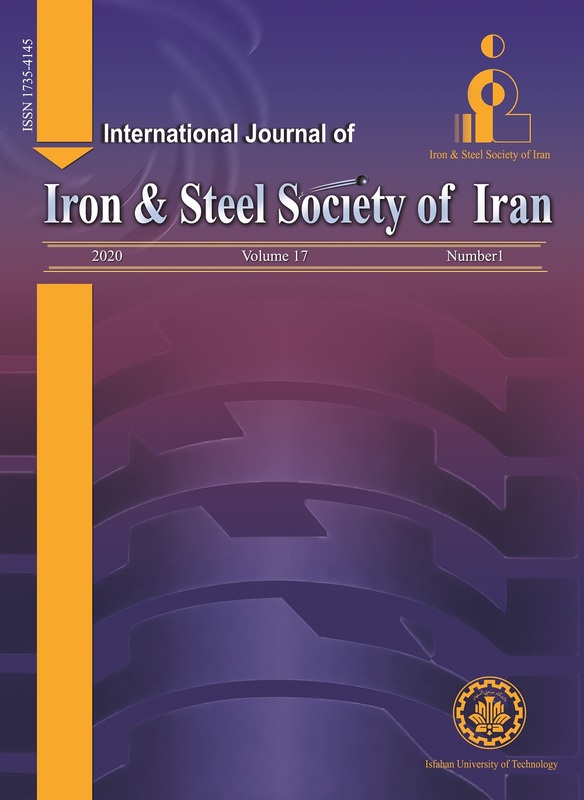 International Journal of Iron & Steel Society of Iran, 6, 2, 2009, 24-27. Ebrahimifar, H., Zandrahimi, M. (2009). 'Oxidation behavior and electrical Characteristics of used interconnects in solid oxide fuel cells at presence of Mn3O4 and MnFe2O4 coatings', International Journal of Iron & Steel Society of Iran, 6(2), pp. 24-27. Ebrahimifar, H., Zandrahimi, M. Oxidation behavior and electrical Characteristics of used interconnects in solid oxide fuel cells at presence of Mn3O4 and MnFe2O4 coatings. International Journal of Iron & Steel Society of Iran, 2009; 6(2): 24-27. In order to enhance the performance of interconnects which are used in solid oxide fuel cells (SOFCs), a protective/conductive coating can be applied. In this research AISI 430 ferritic stainless steel was coated in a Mn-base pack mixture by pack cementation method. In order to evaluate the oxidation behavior, isothermal oxidation was accomplished for 200 h at 800 ºC. Electrical behavior was also investigated as a function of temperature and time. In isothermal oxidation unprotected substrate exhibited more weight gain in comparison with coated sample. The formation of Mn3O4 and MnFe2O4 spinels during isothermal oxidation redounded to the decrease in area specific resistance (ASR) for coated specimens. The ASR was obtained 17.4 mΩ cm2 for coated samples and 36.1 mΩcm2 for uncoated samples after 200 h annealing in static air at 800 ºC. W.Z. Zhu and S.C. Deevi: Mat. Sci.Eng.A., 40(2003), 227. W.J Quadakkers, J. Piron-Abellan, V. Shemet and L. Singheiser: Mater. High. Temp., 20(2003), 115. W.Z. Zhu and S.C. Deevi: Mater. Res. Bull., 38(2003), 957. S. Chandra-Ambhorn, Y. Wouters, L. Antoni, F. Toscan and A. Galerie: J. power sources., 171(2007), 668. Z.G. Yang: Int. Mater. Rev., 53(2008), 39. S.P Jiang, J.P Zhang, L. Apateanu and K. Foger: J. Electrochem. Soc., 147(2000), 4013. Y. Matsuzaki and I. Yasuda:SolidStateIonics., 132(2000), 271. W. Wei, W. Chen and D.G. Ivey: J. Power Sources., 186(2009), 428. Y. Chou, J.W. Stevenson and P. Singh., J. Power Sources., 185(2008), 1001. M.R. Bateni, P. Wei, X. Deng and A. Petric: Surf. Coat. Technol., 201(2007), 4677. H. Ebrahimifar and M. Zandrahimi: J. Met. Mater. Sci., 51(2009), 281. N. Shaigan, D.G. Ivey, and W. Chen: J. Power Sources., 183(2008), 651. N. Shaigan, D.G. Ivey, and W. Chen: J. Power Sources., 185(2008), 331. L. Cooper, S. Benhaddad, A. Wood and D.G. Ivey: J. Power Sources., 184(2008), 220. P. Kofstad and R. Bredesan: Solid State Ionics., 52(1992), 69. N. Shaigan, W. Qu, D.G. Ivey and W. Chen: J. Power Sources., 195(2010), 1529.